WATER - a holistic, living organism Water makes up almost 80% of the human body. It can also be described as a living organism in itself (the blood of the Earth), whose life-force is shown to be depleted through the process of bottling, compression and storage in domestic pipes. 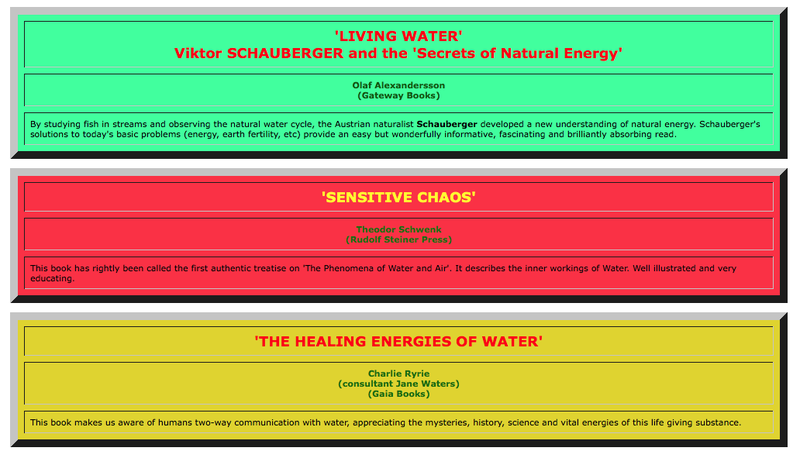 The difference between 'living water' and ordinary, 'damaged water' has been investigated by the Austrian naturalist Johann Grander. He discovered that 'living matter always seeks the vibration it lacks": so, water which is low in energy and vibration will actually deplete rather than nourish our systems. He also stated that water with a low 'Zeta Potential' cannot easily transport nutrients to the body's cells, thus causing the whole system to become clogged. Living water possesses a high 'Zeta Potential' and promotes a more efficient and healthier metabolism. The differences between 'living' and 'dead' water has been demonstrated by German scientists Walfran & Theodor Schwenk through the 'Drop-picture' method. The crystal particles in the 'living water' form into spiral or vortex patterns (implosion) and is normally associated with life and growth. 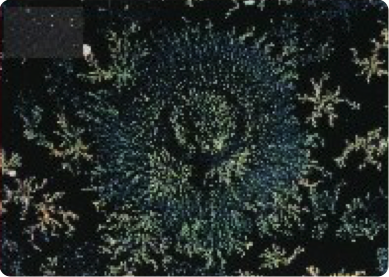 In damaged water the drop-pictures show linear configurations indicating 'lifeless' conditions. True, healthy spring water has a positive and uplifting effect on humans animals and plants. This fact has been recognised and utilised by many civilizations and acknowledged by all experts in the field of water. When healthy spring-water is tested for its energy state with a pendulum, the pendulum responds with a clockwise spin. Ordinary tap water, on the other hand, recipitates no special biological effect and this is reflected in a left spin of the pendulum. 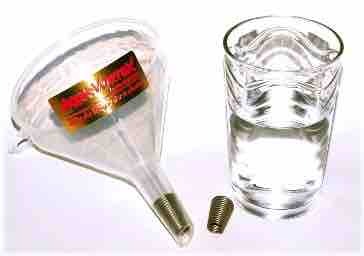 The AQUA-VORTEX is a small, simple, yet powerful device, which re-energizes water and other drinks. It does this purely by harnessing natural laws. It is a vortex-shaped spiral. It comes from Germany where it has been successfully established for over twelve years. For optimum health, it is recommended that one should drink about 2 litres of water each day, 2 glasses a half hour before each meal. Just taste and feel the difference when you experience a glass of energized 'living water'. Allow it to detoxify your system and give you extra energy! When you notice the difference you will want to drink more! Even babies and children gulp down living water because they feel how good it is for them. The AQUA-VORTEX transforms ordinary water into biologically active living water, invigorating to drink and beneficial to the body's metabolism. Water energised and boiled and drunk hot is very soothing. Allowed to cool and energized again, it is 'nourishing'. (Boiling helps clear the 'memory' in water.) The water does not have to 'swirl' or make a vortex in the funnel to be energized by the AQUA-VORTEX. The polarisation reaches its peak about 3 minutes after pouring and lasts for about 6 days. Testing with the Lecher Antenna, a scientific instrument designed to measure these subtle implosion energies that exist at the level of quantum physics (the atomic level), confirm that water treated with the AQUA-VORTEX has a radiant and balancing effect on the human organism, and damaged water has a harmful effect. Living water can be further enhanced by the addition of Volcatech or Flanagan's Liquid Crystal Energy (Colloidal minerals), which creates a water which will help to regenerate the body's cells. Experts in muscle-testing (kinesiology), electro-acupuncture and dowsing can confirm the above. The transformation properties of the AQUA-VORTEXare even more obvious in wines; acidity is reduced, leaving a smoother wine with an enhanced fuller flavour. One satisfied AQUA-VORTEX customer confirms. "the way it improves a mediocre wine has got to be tasted to be believed." All liquids benefit from AQUA-VORTEX tea coffee, milk, beer, mineral water, spirits, even fizzy drinks improve! Before you make a pot of tea or coffee, pour the cold water through the funnel - after filtering, if preferred - and you will experience a fuller flavour and an enriched aroma. Fruit juice also benefits, there really is no limit to what liquid can be used with AQUA-VORTEX. Lime-scale deposits are noticeably reduced when using energized water in your kettle and steam-iron. AQUA-VORTEX not only reduces the build up of time scale, but over time will soften and reduce existing scale for more efficient boiling and healthier hot water. Some people find ways to safely put the AQUA-VORTEX into the hoses leading to shower heads and even washing machines and dishwashers. Plants, both indoor and outdoor, love energized water, just see how their growth is improved. Even cut flowers last longer in 'living water'! Why not share the benefits of living water with your pets? As a simple test, have two bowls of water, one 'living' and one 'damaged' water, you will not be surprised when your cat or dog goes straight for the living water. Cheese made from milk energized with the AQUA-VORTEX matures faster and develops a distinct enhanced flavour. Your AQUA-VORTEX energizer needs virtually no maintenance and will last you for years. It should be cleaned after using with wine, milk, fruit juice etc. by running hot water through it. If the AQUA-VORTEX is used with liquids other than water, discolouring is normal and does not affect its performance. The AQUA-VORTEX can be sterilised by boiling in hot water or washing in the dishwasher. Do not stretch the spiral. Slip the device into the neck of a funnel and pour the water through it. The water is now healthier, energized and ready to drink. Liquids only need to be put through the AQUA-VORTEX once in order to be revitalised. The improvement and re-activation is readily discerned by most people; the taste is better. The body absorbs this enlivened water more easily. Many people have reported reactions associated with drinking true spring water - such as increased thirst and having more vitality. Please note: AQUA-VORTEX is not a water-filter but a water energizer. You may wish to filter or purify your tap water before activating it with the AQUA-VORTEX.